Rolph Scarlett was the first American artist selected to provide paintings alongside Wassily Kandinsky, Paul Klee and Rudolf Bauer for Solomon Guggenheim’s Museum of Non-objective Painting beginning in 1940. Throughout his life Scarlett wavered between representational*, geometric*, non-objective* and abstraction*, the latter representing his true voice and passion. His body of work reflects an artist truly devoted to the exploration and continuation of abstract art, while simultaneously holding onto the romantic conception of the artist being the creator, an idea wholeheartedly rejected by the tenets of Non-Objective art, the works for which he is most well-known. Scarlett’s acceptance into the Museum of Non-Objective painting resulted in a close friendship with its founder, Hilla Rebay, and by 1940, Scarlett had become the new museum’s chief lecturer. Within a decade the Guggenheim owned nearly sixty of his paintings and monoprints. Rebay and supporting artist Rudolph Bauer offered Scarlett constructive criticism during his position at the Museum. 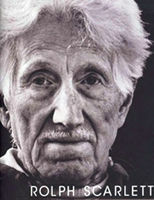 Although Rebay’s support of Scarlett forced him to explore the geometric abstractions (Non-Objective), he continuously stood by his artistic methodology, which is described as ”creating an organization that is alive as to color, and form, with challenging and stimulating rhythms, making full use of one’s emotional and intuitive creative programming and keeping it under cerebral control, so that when it is finished it is a visual experience that is alive with mysticism and inner order, and has grown into a new world of art governed by authority. According to Scarlett scholar and author, Harriet Tannin (also his student), Scarlett created a substantial body of pure abstractions, beginning in the 1930’s and would continue to do them in secret during his tenure of creating non-objective works for Rebay’s Guggenheim, two of which were shown at the Whitney Annual Exhibition in 1951. His works are represented in the permanent collections of numerous museums including the Guggenheim, the Whitney Museum of American Art, the Museum of Modern Art and the Smithsonian.